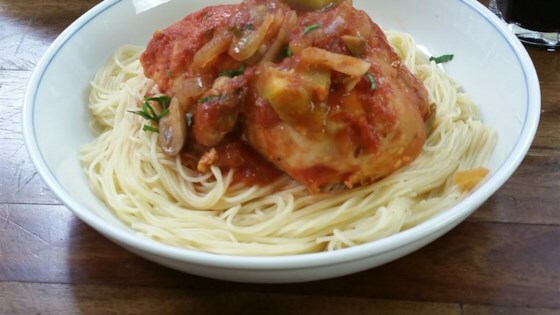 "Easy slow cooker chicken cacciatore. Serve over angel hair pasta. 'Cacciatore' is Italian for 'hunter', and this American-Italian term refers to food prepared 'hunter style,' with mushrooms and onions. Avanti!" Cover, and cook on Low for 7 to 9 hours. My family loves it. Fast, easy. Be careful to cover chicken completely in sauce or the exposed parts will dry out.